Aussies will like running, climbing, long walks – so called "human sports” - and they probably will turn it into a "muscle-dog". But sports are not 100 % able to replace mental work! Conclusion: Physical exercise is good, but not the end of the line. 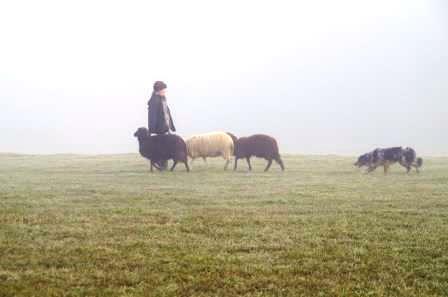 Originally sheepdogs were used to herd livestock. Today herding is widely offered within herding trials, were titles can be achieved. The livestock can be sheep, cows and ducks. SAR means Search and Rescue (of persons). The difference to Mantrail is the kind of search: Mantrailer dogs make their way to a special individual. Here, the dog is confined to a scent article. SAR Dogs are looking in a particular area of a human individual. A scent article is not necessary with SAR. Breitensport is a multi-discipline contest. It contains 4 disciplines: Obedience, hurdles, slalom and obstacle course. Hurdles and slalom have to be done by dog and its handler both at the same time. 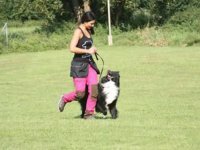 is a dog sport in which it is especially important to execute the exercises very harmonious, fast and accurate. A well-established human-dog team is a prerequisite. The term "Mantrail" defines itself. Every human has a certain individual odor. Dogs noses are able to identify this specific smell and trace it. Mantrailing therefore means that a Mantrailer-dog follows an individual odor trail. The dog is taught various exercises (tricks) to challenge the dog mentally and to have lots of fun together. Treibball is suitable primarily for Sheep and cattle dogs. This sport was developed by Jan Nijboer to give these dogs a suitable employment, as not everyone owns a flock of sheep. As sheep replacement 8 gym balls are used. They have to be driven as fast as possible (under the guidance of the "shepherd" through goals. 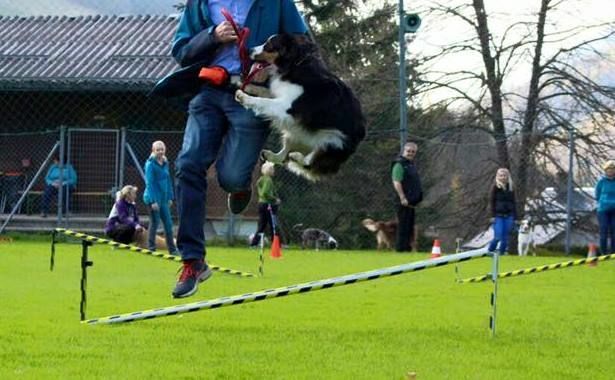 Not every Aussie runs in agility with the same passion and not all Aussies are "herding genius". But every classic Aussie should have his natural working enthusiasm and the will to learn. And it applies - as with humans - to recognize strength, to support them and to compensate existing weaknesses. Not every Aussie is mandatory for all these activities, but he will try everything with eagerness and passion.